I am buying a certified pre-owned 2015 Outback 3.6, 40k miles... because it is certified I have the option of getting the factory extended warranty. I wouldn't normally consider it, however with all of the computerized systems, navi, backup sensor etc, the potential cost of repair if one of these starts acting up makes me think about it. Has anyone had any experience with computer/'electrical' issues in their "smart car", or considered the warranty just because of this issue? It would extend to 7 yrs or 100k. I felt the same way. Between all of the electronics and the cvt, it seemed like a gamble I was willing to make. I have only had the car a month so no issues. 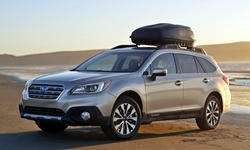 If you have not already, check on subaruoutback.org for more thoughts from lots of owners. Having driven a '10 3.6R over 105K mi, I have had zero issues, aside from replacing a broken volume switch on the steering wheel. Oil consumption is always monitored with no problems. 40K mi in 2 years is heavy use, but I'd conclude any serious issues would have been wrung out already. I have never collected on any extended warranty anybody ever sold me. It's a bad bet. Save the money, maintain the car faithfully, and odds are, you'll be happy. It's a Subaru. If you get nervous later, the resale value is fantastic. Trade it in on a new one. My 2014 does not have all the electronic bells and whistles so I didn't see the need. If you are planning on driving the OB for any length of time, the extended warrantly would be a good idea. I have not heard of any reliability problems with the Subie tech items so far though. Any future late model purchases I make will include an extended warranty to cover the electronics. Subaru's are great cars, the CVT is well proven to be reliable. Subaru has been building CVT's for high HP applications since 2012 (turbo-charged Legacy's in Japan). The electronics related to the engine already have an 80,000 mile warranty. Purchase a 2010 Outback new. Have 53K trouble free miles. Change the oil every 3K. Not knowing who the prior owner was or how the car was treated, inspite of my personal trouble-free experience, I'd probably opt for the warranty, provided the cost is reasonable to you. Don't be afraid to try to negotiate the extended warranty cost with the dealer, or counter with (as an example) the next 4 scheduled service stops included in the purchase.